Spiegel Online has an interview with the head of the German Energy Agency Dena. Kohler: According to the generally accepted opinion, the transition to renewable energy sources means that we will give up nuclear power and rely on wind and solar instead. The reality is that we'll need conventional power plants until at least 2050, even if we do create massive renewable energy sources. Many people dispute this. They say that we could replace power plants operated with fossil fuels by adding more renewable energy sources. My response to them is: It won't work. Kohler: When a new wind farm is opened and we're told how many thousands of households it can supply with electricity, that number applies to only a quarter of our demand. In Germany, 75 percent of electricity goes to industry, for which a secure supply -- that is, at every second, and with constant voltage -- is indispensable. Neither solar nor wind power are suitable for that purpose today. Both fluctuate and provide either no secure supply or only a small fraction of a secure supply. Solar energy has a load factor of about 1,000 hours a year. But there are 8,670 hours in a year." 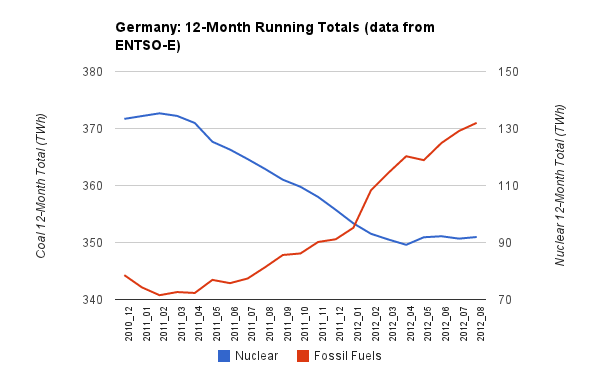 I had previously commented on an article noting a study by Dena indicating Germany would continue to have a need for significant traditional (fossil fuel) capacity even in 2050. Siegmar Gabriel currently leads Germany's second-most popular political party, so it's important to note he is starting to look wrong about this ... or rather, he has failed to note that no other generation technologies combine well with renewables. 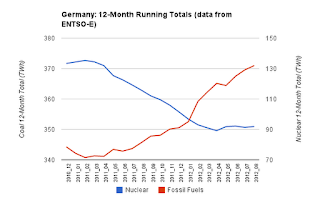 Germany's electricity exports have risen above pre-Fukushima levels, at very depressed prices; the search continues for how to ensure new generation facilities are built with as little subsidy as possible, the wealth is draining from it's existing utilities, and it looks very likely emissions will rise this year despite an economy likely to see GDP expand at under 1%. well seriously, I like the content..its great knowledge in this.